There’s always something magical about horses, isn’t there? Whether winged or at home in the water, mechanical or mythological, the equines that gallop through these pages span the fantasy spectrum. In one story a woman knits her way up to the stars and in another Loki's descendant grapples with bizarre transformations while fighting for their life. A woman races on a unique horse to save herself from servitude, while a man rides a chariot through the stars to reclaim his self-worth. From steampunk-inspired stories and tales that brush up against horror to straight-up fantasy, one theme connects them all: freedom. 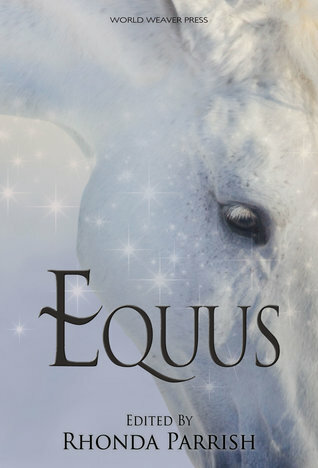 Equus is a delightful collection of stories which, as you might expect from the title, all feature horses in one form or another. There's an eclectic mix, including Sleipnir and unicorns, and most of the tales are fantasy or magical realism. As always with an anthology, some stories appealed to me more than others. There was only one at which I took umbrage, and that was because it set up a major plot idea but then suddenly ended, as if, perhaps, it was an intro to a novel. To me, anthology stories should be complete in and of themselves; I don't want to have to go out and buy another work to see how the tale will end. But that's a minor complaint as the rest of the stories were all most enjoyable. If you love horses and fantasy, this is definitely a collection for you.